A free DLC pack adds new maps, characters, and weapons. For a game that came out almost three months ago, the Mass Effect galaxy still needs an awful lot of saving. No matter how many times galactic heroes team up in the Galaxy at War multiplayer mode, more Reapers, geth, and Cerberus members swoop down on them like ravenous vorcha, and BioWare sees no reason to stop the swarms now. 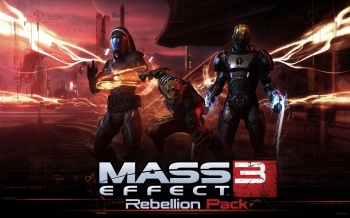 Like the Resurgence pack before it, the Mass Effect 3: Rebellion DLC pack will introduce two maps, six characters, and an assortment of weapons in addition to a few other goodies. Best of all, the whole pack will be available free of charge in less than a week. The secret of Rebellion has been out for a few weeks, but BioWare has only just verified it. While the package will introduce a new shotgun, assault rifle, and sniper rifle, the real meat and potatoes of the DLC are the new maps and characters. Firebase Jade is a jungle environment, while Firebase Goddess will return players to the asari homeworld of Thessia. New characters include male versions of the quarian infiltrator and engineer, two ex-Cerberus soldiers (a vanguard and an adept), and two vorcha: a soldier and a sentinel. This represents the first time that the violent, somewhat unhinged race is available in a playable capacity in a Mass Effect game. Players will also find themselves responsible for picking up a package and escorting it to a drop-off point as a new objective during certain enemy waves. Would-be galactic saviors should be advised that while the two new levels will be playable right off the bat, they will have to unlock the rest of Rebellion's content via supply packs, same as any other character or weapon. Furthermore, the download will only be free for those who own a Mass Effect 3 online pass, although one must wonder what someone without an online pass would want with a multiplayer DLC pack in the first place. Rebellion will be available for download on May 29 in North America and European PCs and 360s; however, European PS3 owners will have to wait until May 30 for the pack. BioWare did not give a reason for the one-day delay, but no one ever said that smuggling packets of resistance data past the Reaper invasion of Earth would be easy.